Area X is under the control of an organization known as the “Southern Reach”, which gives this great new series by Jeff Vandermeer its title. 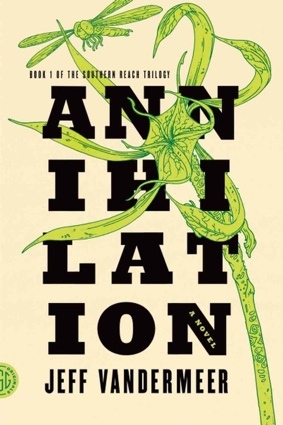 Annihilation is the first of three short Southern Reach novels that will be released in 2014, and if the first one is any indication of quality, readers will be in for a treat all year long. Annihilation combines dread and cosmic horror like that found in the works of H.P. Lovecraft with interpersonal dynamics between characters and sheer visceral thrills reminiscent of Stephen King at his best. For whatever reason, the clinical depictions of nature gone mad in the Area recalled to me sequences from Tarkovsky’s film Stalker, much like the last book I read, The Slynx by Tatyana Tolstaya, although it also put me in mind of the dreamworld landscape found in Christopher Nolan’s Inception. The concept of a small area that suddenly changes and goes down its own evolutionary path also recalled an arc in Rick Remender’s excellent run on X-Force from a few years back, when the team returned to the world that gave Fantomex his origin. All of this is to say that Annihilation is a very good book indeed, a slice of paranoia-inducing, creeps-giving horror that gripped me from beginning to end. I was initially a little put off by the dry, “by the book”-style narration delivered to us by the biologist, but I soon found it a comfort compared to what it could have been. Annihilation is definitely influenced by H.P. Lovecraft, but thankfully omits the overwrought vocabulary and hysterical feel of those stories, preferring instead to lay out its horror for readers in an easy to understand fashion that does not grate. Also like in Lovecraft’s work, journals make up a large part of the story, and I really appreciated how Vandermeer was never sidetracked by this device. He kept his focus on the biologist and her story throughout, and while it easily could have been a collection of journal entries this book never turned into a collection of found works like the annoying Night Film from last year did. Vandermeer hits you with fascinating concept after fascinating concept, page by page. While we learn next to nothing about the Southern Reach organization in this volume, their management techniques in Area X are on full display in the person of the psychologist, who is revealed very early on as using post-hypnotic suggestion on the rest of the group to keep them in line. No sooner is this revealed, though, than the existence of new animals in the Area is discovered, and then writing made of living beings, and so on, and so on. It’s exhilarating to see so many fascinating new ideas spiraling through the book, each of which could easily have been a short story of their own, if not a novel. I also loved the dynamics between the four women exploring the area. They were instantly recognizable as a group of professionals who may or may not see eye to eye on everything, and this essential humanity is very useful as the plot becomes more and more crazy and weird. I’m intrigued to learn more about the previous expeditions, as the goal of the twelfth one seems mostly to be an offering to the Area, a new cross-section of humanity for it to interact with, and I’d like to see what the previous experiments in this vein were as well. I don’t want to say too much more about this perfectly-sized volume, as I’d like to encourage all of you to check it out on your own. I’ve already got the second book in the Southern Reach trilogy, Authority, and I can’t wait to tear into it.